The streamlined body can reduce the wind resistance and make sure the safety of the product.The light body can reduce the press of the taxi roof. 144 LEDs can make the ads more attractive in the dark environment. 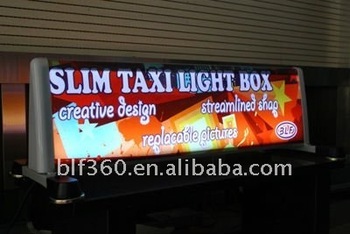 LED light is bright and have a long working life. EASY TO INSTALL AND NO DAMAGE TO CAR. There are strong magnets on the bottom of the stand of this product., so the only thing you need to do to install the product is to “put” it on the top of the car. (CDL100/120M)We adopt 4 NdFeB Magnets which can make sure the safety of this product under high speed situation. The pictures can easily be changed by yourself in one minute. Your time any money can be saved. This product has two size to fit different types of car. Large size can be used on BUCIK, CHRYSLER, FORD and small size can be used on TOYOTA, HYNDAI, and CHEVROLET. Bracket stand and magnet stand both can be used on our products.